Color Snack is an online resource for artists & creatives, specifically geared towards teaching techniques for painting with watercolors. Founded by a lovely woman named, Volta, she consistently produces colorful paintings and video content while sharing her tips and tutorials (check out her 1 minute tutorials here). We've had a lot of exposure to watercolor painting in our lives (our mother is an artist and watercolors are her preferred medium). We've always been amazed by the fact that 2 different people can pick up the SAME paint brushes and the SAME tubes of paint and somehow end up with 2 completely UNIQUE pieces of art. This is because there are endless styles and techniques, depending on who is holding the paint brush! Thus, we are all artists! This is something Volta believes strongly and is the backbone of her Color Snack Creative School. Volta's painting style is colorful, whimsical and she has a thing for pretty FOOD. We've been mutually following each other on Instagram for a while, developing a friendship over the interwebs. Volta, recently ordered a box of our Monochrome Macarons so we were able to connect IRL. 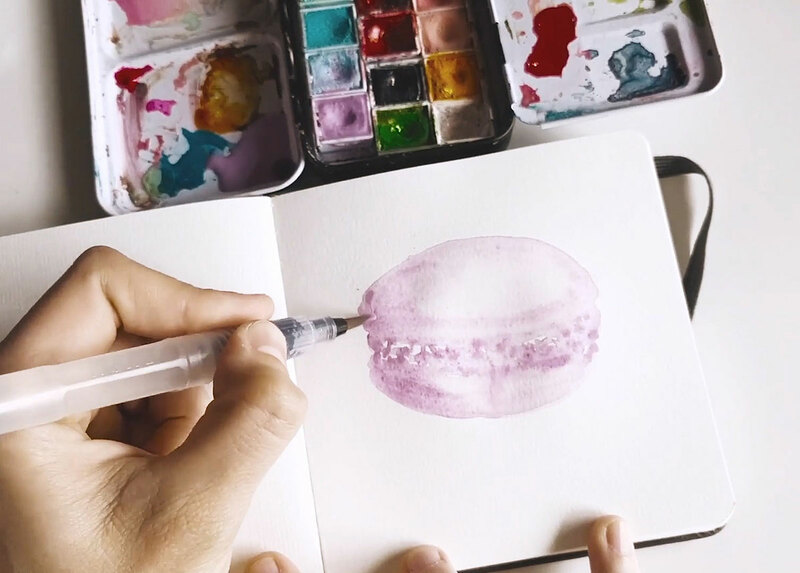 She surprised us with this AMAZING watercolor painting of our Lavender Rosemary Macaron.